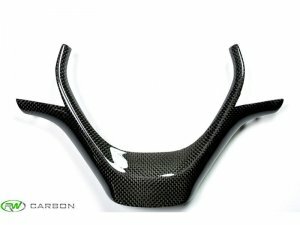 Finish your carbon fiber interior theme with this beautifully crafted carbon fiber steering wheel trim for your BMW F30 Sedan and F32 Coupe Non M sport. If you purchased your new BMW without the M Sport package then this steering trim piece is just what you need to spice up your interior. It is made out of durable ABS plastic and then carefully wrapped with real 1x1 carbon fiber fabric. Each trim piece is meticulously clear coated and inspected to ensure you the consumer recieves a perfect product.